The gulf in form between Borussia Dortmund and Bayern Munich has been widening ever since the winter break got over, but no one would have expected a 5-0 thrashing for Dortmund at Bayern’s home in perhaps the most anticipated Der Klassiker in recent times. 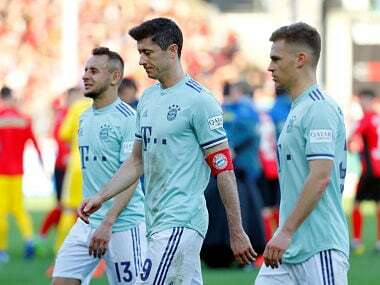 The most tightly-fought Bundesliga title race in ages now has an added dimension with Bayern wresting back the top spot in the league with six matches to go till the end of the season. The march for the Premier League has been equally compelling with Liverpool now taking the lead with a hard-fought victory against Southampton at the weekend. But the real race in the Premier League has been for the final two Champions League spots with only three points separating third-placed Tottenham Hotspur and sixth-placed Manchester United. Here are four talking points from the gameweek which also featured what is widely considered ‘the greatest ever miss in football’ by PSG’s Eric Maxim Choupo-Moting in their draw against Strasbourg which means the Paris outfit now has to wait another week to start their title celebrations. 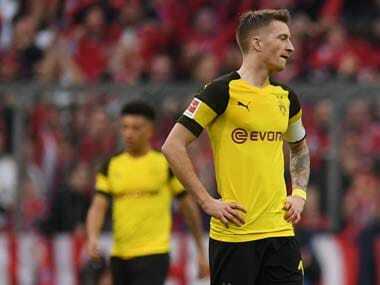 Borussia Dortmund handed over the first place on the Bundesliga table to rivals Bayern Munich on the weekend after suffering a 5-0 hammering at the hands of the Munich side. Dortmund were poor in the first half and allowed the home side to score four — despite a good game by goalkeeper Roman Burki — which knocked them off their stride by the 45th minute. Lucien Favre’s men weren’t capable of handling Bayern’s pace, intensity and, most importantly, their desire to win the match. Surprisingly for Dortmund, their influential midfield duo of Alex Witsel and Thomas Delaney could not stamp their authority in the centre, which was perhaps the biggest reason for the first half collapse. It didn’t help that Dortmund were without the services of their star striker Paco Alcacer, who suffered an arm injury in their previous outing. On the face of it, this is Bayern’s title to lose after what is increasingly being termed as the turning point in the race to be Bundesliga champions. While this might still be the case, with Bayern looking the sharper side, there is still just a point separating the two sides. Both sides have six games remaining now, but Dortmund seem to have an easier run-in (at least on paper) — their local derby with Schalke representing the biggest challenge. 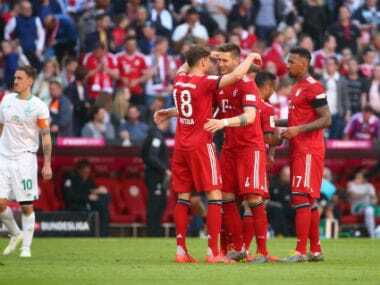 Bayern’s fixture list sees them finish the season against RB Leipzig (third-placed) and Eintracht Frankfurt (fourth) which could both be tricky outings with both sides looking to confirm their Champions League qualification. Barcelona’s win on the weekend against second-placed Atletico Madrid propelled the Catalonian side 11 points clear of their nearest rivals with just seven games left to play, meaning Ernesto Valverde’s men are on the cusp of yet another LaLiga title. It wasn’t all smooth sailing for Barcelona though and the match had looked destined to finish goal-less till Luis Suarez broke the deadlock with a fantastic curler in the 85th minute. The goal opened up the match and deflated the Atleti defence which gave Lionel Messi an opportunity to seal the match with a second goal. The partnership of Suarez and Messi at the top for Barcelona has gone unheralded for most parts of the season but the duo has hit over 50 goals in the LaLiga with both contributing over 20. The match also marked World Cup-winner Antoine Griezmann’s first visit to the Camp Nou after the release of a Netflix documentary in which he revealed his decision to stay with Atleti despite transfer interest from Barcelona. The home fans certainly weren’t impressed with the French forward and made it a point to boo him every time he touched the ball. Griezmann has never scored at the Camp Nou, and Barcelona ensured that record continued on Saturday. Juventus are on the brink of another Serie A title, but their match against arguably their biggest rivals in the past few decades, AC Milan, was a glimpse of the future than the past. Moise Kean was the star once again for the Old Lady of Turin, coming off the bench to score the all-important winner in Saturday’s match against Milan. 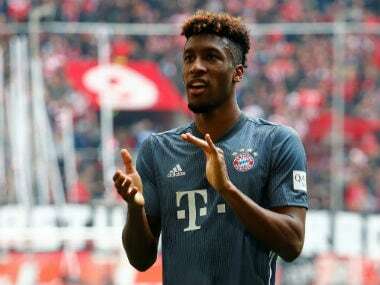 The young forward was in the headlines in the mid-week after he reacted to racist chants during Juventus’ match at Cagliari. Strangely, his manager Massimiliano Allegri and teammate Leonardo Bonucci pinned part of the blame on the young Italian forward — who is enjoying a breakout season — suggesting it was the striker’s mistake to have celebrated in front of the Cagliari’s ‘ultras’. Kean showed maturity beyond his age to free his mind of the recent mishaps and concentrate on his football at the weekend. Arsenal failed to take their chance to go third in the Premier League when they succumbed to a 1-0 loss against Everton in the weekend. The Gunners, especially their defenders, struggled throughout the game and the London side was perhaps lucky not to have conceded more. Arsenal’s inability to gain control of midfield with Andre Gomes spraying passes at will and Idrissa Gana Gueye covering the entire field with ease was also a major factor in the loss. Three points now separate Spurs (64), Arsenal (63), Chelsea (63) and Manchester United (61), and any team can end up third, with all going through a mixed patch of form.